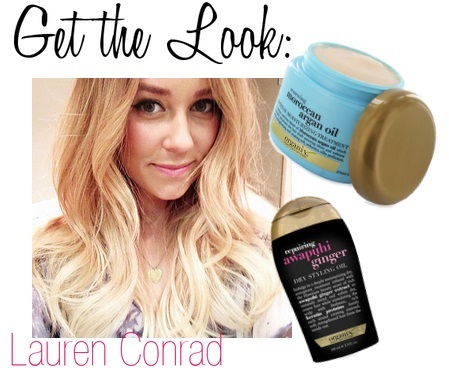 Lauren Conrad is one of those celebs that gives me a serious case of hair envy so when I heard the Cali girl uses Organix to achieve her gorgeous locks - I knew I must share it with you lovelies! To keep her hair looking and feeling healthy, Lauren treats herself to Organix Moroccan Argan Oil Renewing Treatment at least once a week. This hydrating formula restores hair’s inner health by infusing antioxidant argan oil to strengthen, increase elasticity and add brilliant shine. After curling her hair, she uses Organix Repairing Awapuhi Ginger Dry Styling Oil to smooth any frizz and flyaways. This moisture restoring oil repairs damage caused by heat and styling tools to increase strength, boost shine and fight frizz. Thanks to Organix, you too can use Lauren’s self-proclaimed beauty obsessions to achieve healthy, Hollywood-worthy hair. The Organix Moroccan Argan Oil Renewing Treatment and Awapuhi Ginger Dry Styling Oil are available for $7.99 each at Rite Aid, Walgreens, CVS as well as other major retailers. I love the way her hair looks - I'm always on the hunt for new products. Must check this out! Wish my hair looked like hers.